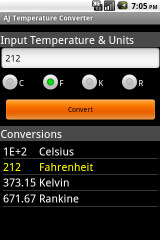 Convert from degrees Fahrenheit to Celsius. Get this calculator on your Android smartphone or tablet. Scan the QR code below or download from the Android Market. blogs and other internet pages.